The Instagram sleuth outed a false dial; the auctioneer apologised without reservation. Just as the world was settling in for the first weekend of 2018, the watch scholar who goes by Perezcope shook things up. He posted well documented and irrefutable evidence that a Rolex Daytona ref. 6239 sold at Phillips’ first Hong Kong sale in December 2015 had a modified dial, one that had “Cosmograph” erased so as to make it a more valuable – a lot more valuable – “Solo” dial. Perezcope pointed out the same watch, still possessing its “Cosmograph”, was sold at Antiquorum in 2011. Phillips swiftly admitted its error and apologised. The auctioneer also reiterated out that any watch it sells is backed by a guarantee of authenticity, a common clause in auction contracts, adding that the buyer of the not-so-“Solo” in question will be given a refund. Such a practice is common across all major auction houses, explaining why many collectors buy at auction despite it occasionally being more expensive. Given Phillips’ rapid notching up of record prices for watches and its unashamed promotion of that success, the social media world’s response was to pile on. In the hours between Perezcope’s revelation and Phillips’ apology, almost 200 comments were posted, ranging from the vitriolic to the comical (including “Watchjesus” promising divine retribution), leaving Perezcope to prune some of the offensive and irrelevant ones. Throughout all the sound and fury of the discussion, certain truths remained unchanged. The most crucial: auction houses sometimes sell incorrect watches. Not with fraudulent intent, but by mistake or lack of knowledge. What really matters, and what separates the top auction houses from the second class ones, is what is done after the fact. Phillips has promised a refund in this case, and if they were in the same position, Christie’s and Sotheby’s would too. Your correspondent has personal experience with such a situation with one such auction house; they made good on their mistake and that’s what matters. Meanwhile, Perezcope has promised more articles covering problematic watches, especially the Rolex Daytona. If he goes beyond auction houses, and trains his eye on watches offered by private dealers, things will certainly get more interesting, and no doubt more rancorous. A Swiss art director now based in Kuala Lumpur, Jose “Perezcope” Pereztroika started debunking Panerai myths and falsehoods in 2015. He has since broadened his repertoire to include Rolex, a prudent move given that Panerai is nowhere near as hotly collected as it once was, evidenced by the low prices or passing of Panerai watches at auction. After all, if a knight slays a dragon, but no one witnesses the slaying, will the villagers rejoice? 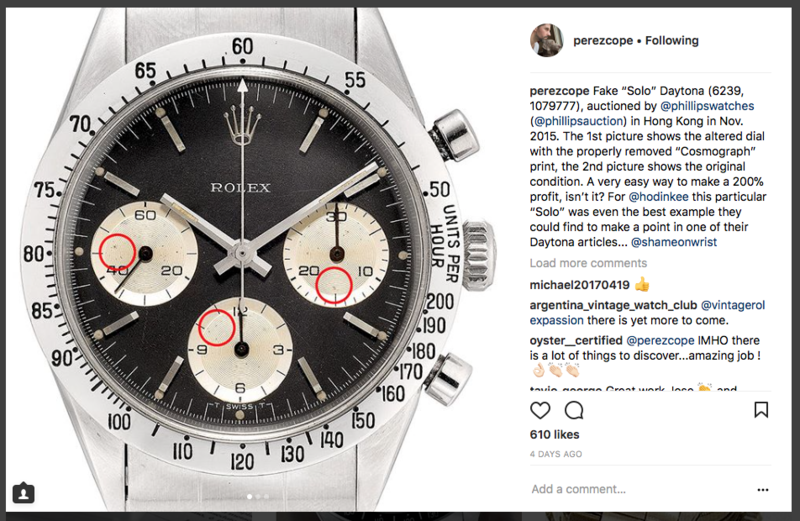 With Phillips’ Daytona Ultimatum auction coming up in May, and Perezcope promising to continue his dragon-slaying, it stands to reason that the auctioneer might work with the sleuth to sieve out any bad watches before the sale.